منوچهریان فرد, منوچهر, بیکی, حسین. (1394). اندازه گیری ضریب نفوذ بنزوئیک اسید در نانوسیال آب ـ گاما آلومینا در دمای ثابت. نشریه شیمی و مهندسی شیمی ایران, 34(3), 31-39. منوچهر منوچهریان فرد; حسین بیکی. "اندازه گیری ضریب نفوذ بنزوئیک اسید در نانوسیال آب ـ گاما آلومینا در دمای ثابت". نشریه شیمی و مهندسی شیمی ایران, 34, 3, 1394, 31-39. منوچهریان فرد, منوچهر, بیکی, حسین. (1394). 'اندازه گیری ضریب نفوذ بنزوئیک اسید در نانوسیال آب ـ گاما آلومینا در دمای ثابت', نشریه شیمی و مهندسی شیمی ایران, 34(3), pp. 31-39. منوچهریان فرد, منوچهر, بیکی, حسین. اندازه گیری ضریب نفوذ بنزوئیک اسید در نانوسیال آب ـ گاما آلومینا در دمای ثابت. 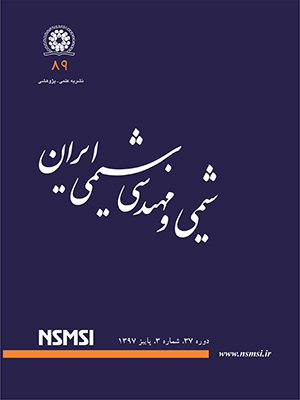 نشریه شیمی و مهندسی شیمی ایران, 1394; 34(3): 31-39.
in Nanofluids, International Journal of Thermal Sciences, 87(0): 49-67 (2015). برزگان، ن.، پناهی زاده، ف.، بررسی کاربرد نانوسیالات اتیلن گلیکول-اکسید آلومینیوم به عنوان سیال خنک کننده در مبدل حرارتی دو لوله ای، مجله مهندسی مکانیک مدرس، (3)11: 75 تا 84 (1390). نظری، م، کیهانی، م، سلطان زاده، م، بررسی تجربی انتقال حرارت نانوسیال آلومینا/آب داخل لوله افقی، نشریه علمی پژوهشی مکانیک هوافضا، (1)9: 45 تا 52 (1392). نوعی، ح.، حریری، ف.، نوعی، م.، حسینقلی، ن.، زینالی هریس، س.، بررسی تجربی عملکرد نانوسیال مس اکسید-استون بر بازده گرمایی یک ترموسیفون دوفازی بسته، نشریه شیمی و مهندسی شیمی ایران، (3)32: 31 تا 38 (1392). Mohebbi K., Rafee R., Talebi F., Effect of Rib Shapes on Heat Transfer Characteristics of Turbulent Flow of Al2O3-Water Nanofluid Inside Ribbed Tubes, Iran. J. Chem. Chem. Eng. (IJCCE), 34 (3): 61-77 (2015). Saien J., Bamdadi H., Mass Transfer from Nanofluid Single Drops in Liquid-Liquid Extraction Process, Industrial and Engineering Chemistry Research, 51(14): 5157-5166 (2012). Beiki H., Nasr Esfahany M., Etesami N., Laminar Forced Convective Mass Transfer of γ-Al2O3/Electrolyte Nanofluid in a Circular Tube. International Journal of Thermal Sciences, 64(0): 251-256 (2013). Beiki, H., M. Esfahany, and N. Etesami, Turbulent Mass Transfer of Al2O3 and TiO2 Electrolyte Nanofluids in Circular Tube, Microfluidics and Nanofluidics, 15(4): 1-8 (2013). Keshishian N., Nasr Esfahany M., Etesami N., Experimental Investigation of Mass Transfer of Active ions in Silica Nanofluids, International Communications in Heat and Mass Transfer, 46(0): 148-153 (2013). Olle B., Bucak S., Holmes T. C., Bromberg L., Hatton T. A., Wang D. C., Enhancement of Oxygen Mass Transfer Using Functionalized Magnetic Nanoparticles, Industrial and Engineering Chemistry Research, 45(12): 4355-4363 (2006). Jung J.-Y., Lee J., Kang Y., CO2 Absorption Characteristics of Nanoparticle Suspensions in Methanol, Journal of Mechanical Science and Technology, 26(8): 2285-2290 (2012). Lee J.W., Jung J. Y., Lee S. G., Kang Y. T., CO2 Bubble Absorption Enhancement in Methanol-Based Nanofluids, International Journal of Refrigeration, 34(8): 1727-1733 (2011). Kim J.-K., Jung J.Y., Kang Y.T., The Effect of Nano-Particles on the Bubble Absorption Performance in a Binary Nanofluid, International Journal of Refrigeration, 29(1): 22-29 (2006). Ma X., Su F., Chen J., Bai T., Han Z., Enhancement of Bubble Absorption Process Using a CNTs-Ammonia Binary Nanofluid, International Communications in Heat and Mass Transfer, 36(7): 657-660 (2009). Pang C. et al., Mass Transfer Enhancement by Binary Nnofluids (NH3/H2O + Ag Nanoparticles) for Bubble Absorption Process, International Journal of Refrigeration, 35(8): 2240-2247 (2012). Wu W., Chang P., Wei S., Xiang C., Runyu W., Enhancement on NH3/H2O Bubble Absorption in Binary Nanofluids by Mono Nano Ag, Huagong Xuebao/CIESC Journal, 61(5): 1112-1117 (2010). Lee J.K., Koo J., Hong H., Kang T. T., The Effects of Nanoparticles on Absorption Heat and Mass Transfer Performance in NH3/H2O Binary Nanofluids, International Journal of Refrigeration, 33(2): 269-275 (2010). Lee J.K., Kim H., Kim M. H., Koo J., Kang Y. T., The Effect of Additives and Nanoparticles on Falling Film Absorption Performance of Binary Nanofluids (H2O/LiBr + Nanoparticles), Journal of Nanoscience and Nanotechnology, 9(12): 7456-7460 (2009). Komati S., Suresh A.K., CO2 Absorption Into Amine Solutions: A Novel Strategy for Intensification Based on the Addition of Ferrofluids. Journal of Chemical Technology and Biotechnology, 83(8): 1094-1100 (2008). Komati S., Suresh A.K., Anomalous Enhancement of Interphase Transport Rates by Nanoparticles: Effect of Magnetic Iron Oxide on Gas-Liquid Mass Transfer. Ind. Eng. Chem. Res., 49: 390-405 (2010). Sara O.N., Icer F., Sahin B., Effect of Suspended CuO Nanoparticles on Mass Transfer to a Rotating Disc Electrode, Experimental Thermal and Fluid Science, 35(3): 558-564 (2011). Wen J.P., Jia X.Q., Feng W., Hydrodynamic and Mass Transfer of Gas-Liquid-Solid Three-Phase Internal Loop Airlift Reactors with Nanometer Solid Particles, Chemical Engineering and Technology, 28(1): 53-60 (2005). Feng W., Wen J., Fan J., Yuan Q., Jia X., Sun Y., Local Hydrodynamics of Gas-Liquid-Nanoparticles Three-Phase Fluidization, Chemical Engineering Science, 60(24): 6887-6898 (2005). Park S.-W., Choi B., Kim S., Lee B., Lee J. W., Absorption of Carbon Dioxide Into Aqueous Colloidal Silica Solution with Diisopropanolamine. Journal of Industrial and Engineering Chemistry, 14(2): 166-174 (2008). Krishnamurthy S., Bhattacharya P., Phelan P.E., Enhanced Mass Transport in Nanofluids, Nano Letters, 6(3): 419-423 (2006). Fang X., Xuan Y., Li Q., Experimental Investigation on Enhanced Mass Transfer in Nanofluids. Applied Physics Letters, 95(20) (2009). Turanov A.N., Tolmachev Y.V., Heat- and Mass-Transport in Aqueous Silica Nanofluids, Heat and Mass Transfer/Waerme- und Stoffuebertragung, 45(12): 1583-1588 (2009). Gerardi C., Cory D., Boungiorno J., Hu L. W., McKrell T., Nuclear Magnetic Resonance-Based Study of Ordered Layering on the Surface of Alumina Nanoparticles in Water, Applied Physics Letters, 95(25): 253104, (2009). Ozturk S., Hassan Y.A., Ugaz V.M., Interfacial Complexation Explains Anomalous Diffusion in Nanofluids, Nano Letters, 10(2): 665-671 (2010). Veilleux J., Coulombe S., A Total Internal Reflection Fluorescence Microscopy Study of Mass Diffusion Enhancement in Water-Based Alumina Nanofluids, Journal of Applied Physics, 108(10): 104316-104327 (2010). Subba-Rao V., Hoffmann P.M., Mukhopadhyay A., Tracer Diffusion in Nanofluids Measured by Fluorescence Correlation Spectroscopy, Journal of Nanoparticle Research, 13(12): 6313-6319 (2011). Ashrafmansouri S.S., Esfahany M. N., Azimi G., Etesami N., Experimental Investigation of Water Self-Diffusion Coefficient and Tracer Diffusion Coefficient of Tert-Butanol in Water-Based Silica Nanofluids. International Journal of Thermal Sciences, 86(0): 166-174 (2014). Delgado J.M.P.Q., Molecular Diffusion Coefficients of Organic Compounds in Water at Different Temperatures. Journal of Phase Equilibria and Diffusion, 28(5): 427-432 (2007). Delgado J.M.P.Q., Alves M.A., Guedes de Carvalho J.R.F., A Simple and Inexpensive Technique to Measure Molecular Diffusion Coefficients. Journal of Phase Equilibria and Diffusion, 26(5): 447-451 (2005). Oliveira, A.C., Coelho M. G., Pires R. F., Franco M. R., Solubility of Benzoic Acid in Mixed Solvents. Journal of Chemical & Engineering Data, 52(1): 298-300, 2006. Cussler E.L., "Diffusion: Mass Transfer in Fluid Systems", 3rd ed., Cambridge University Press, (2009). Skelland A.H.P., "Diffusional Mass Transfer", John Wiley, (1974). Treybal R.E., "Mass Transfer Operations", 3rd ed., New York: McGraw-hill, (1981). Dunker C., "Benzoic acid, in Kirk-Othmer Encyclopaedia of Chemical Technology", Interscience. p. 422, (1964). Lozar J., Laguerie C., Couderc J.P., Diffusivité de l'acide Benzoi'que Dans l'eau: Influence de la Température. The Canadian Journal of Chemical Engineering, 53(2): 200-203 (1975). Buongiorno J., Convective Transport in Nanofluids. Journal of Heat Transfer, 128(3): 240-250 (2006). Feng X., Johnson D.W., Mass Transfer in SiO2 Nanofluids: A Case Against Purported Nanoparticle Convection Effects, International Journal of Heat and Mass Transfer, 55(13–14): 3447-3453 (2012).